Great news on the Alberta theatre scene! Absolutely, insanely good news this week on the theatre scene from Theatre Alberta and Alberta Playwrights Network. Bonkers, really. Just now, on CBC Radio Daybreak Alberta, the world met the winner of the Alberta Playwriting Competition’s grand prize, Katherine Koller. I’m especially giddy about this one because a scene from her winning play, Last Chance Leduc, was presented at Peep Show at the first Skirts Afire festival earlier this year, so I’ve already heard some of it, and it’s amazing. Katherine is a terrific writer — I’m so happy for her! AND. As part of her prize, Katherine’s play will getting a public reading at this year’s Playworks Ink conference, which for the first time will be held at the Banff Centre. AND. 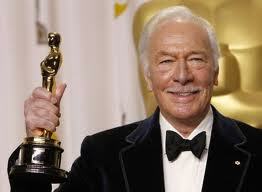 One of our guests, giving a masterclass, will be Christopher Plummer. Read that again. Please. I had to. Registrations aren’t open just yet. Please keep on eye on Theatre Alberta’s site for when they are, and book right away. But not before me. I’ve booked the time off work and I’m getting in first. This entry was posted in photo, publicity, theatre, tickets, writing and tagged academy award, actor, alberta, alberta playwrights network, apc, APN, audience, banff, banff centre, christopher plummer, drama, katherine koller, last chance leduc, leduc, oscar, peep show, playworks ink, playwright, playwriting competition, reading, skirts afire, theatre alberta by theatrejunkiehm2012. Bookmark the permalink.